This post is sponsored by House of Fraser. All thoughts, styling and opinions are my own, as always. 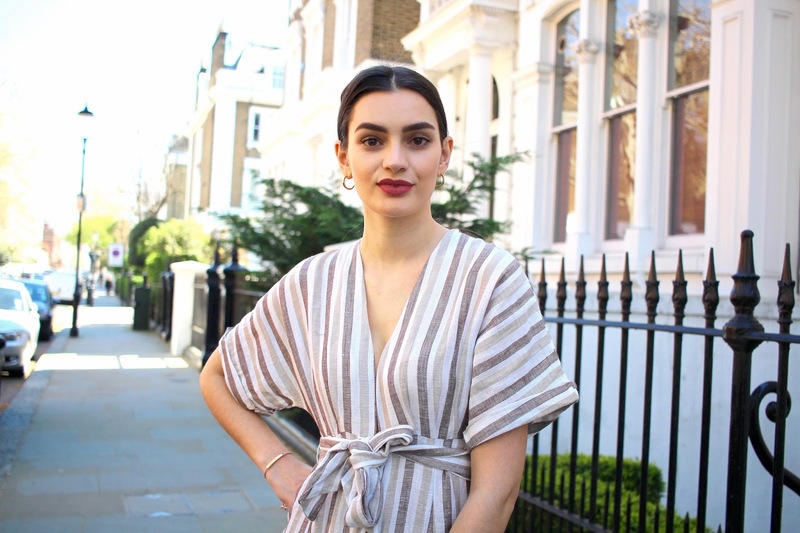 As today's post is all about the shoes, I'm keeping this look very simple by wearing a plunge neck striped midi dress from Free People - available now at House of Fraser. This is the kind of dress I can see myself wearing casually on holiday but also dressing up for a summer's evening in the city. The only thing required to change this up is a change of shoes (and a few other accessories if you fancy) and with that, you're good to go - whatever the occasion. I've included three different looks (so this is a pretty hefty blog post, I hope you're ready for it!) all of which I think would be perfect for different occasions you have in your diary over the next few months. For my first outfit I had summer holidays on my mind, I absolutely love pairing dresses with sandals whilst abroad and I can imagine wearing this outfit on a sunny beach somewhere whilst on vacation. It's just the perfect, casual, easy-to-wear ensemble for a stress free zone. Can you tell I'm ready for a holiday?! There's honestly nothing better than being able to pop on a lightweight dress and slip on some sliders as you head out the door. These sliders are by Steve Madden at House of Fraser and they're absolutely perfect. Whether you decide to wear them poolside or slip them on as you're rushing out the door on a warm day in London, they're so comfy and definitely look the part! They come in a variety of colours including white, black and rose gold. I decided to go for white as I've been loving wearing white recently so naturally, I wanted some shoes to match! I genuinely can't wait to take these away with me, I'm pretty sure they'll become a summer staple quite quickly. Look number 2 features possibly the most beautiful espadrille wedges ever! I feel like espadrilles have had a bit of a comeback over the past couple of years and I'm all here for it. Whilst I'm well aware they've always been a summer staple, I think I ended up associating wedges with party destinations abroad and just haven't been inclined to wear them. This year I've seen so many more in stores and on bloggers so naturally, I've been itching for a pair. As soon as I laid eyes on these yellow espadrilles I was smitten! They're by Mint Velvet at House Fraser and there are very few remaining so if you like them then I would suggest snapping them up asap before they're gone. These look absolutely gorgeous paired with neutral colours, hence why this dress is so perfectly suited. I'd wear this outfit day-to-day in London, it's a nod to summer but still practical and so comfortable - honestly, I wore these for the first time yesterday (the hottest day of the year so far) and I was so impressed with how comfy they were, I couldn't have tested them any better! I added my basket bag from Dune, which you can also get your hands on via House of Fraser if you fancy! I simply wore it cross body, which is my personal preference when it comes to wearing my bags on a daily basis so I love how simple this is and how versatile too! When picking my final pair of shoes I knew I wanted to keep spring parties in mind. I find it can be quite difficult to decide on the perfect shoe for a spring gathering, whether that be for something really formal like a wedding or more casual like a garden party - some sort of smarter shoe is needed for these occasions. It's just one of those things that is good to have in your shoedrobe year after year. I chose a pair of brown block heel sandals from Office at House at Fraser, no guesses as to why I picked brown... I'm really loving neutral tones at the moment so some brown shoes are an absolute must for me right now. I'm sure I'll wear these so much throughout the next few months! I also absolutely love that the buckle detailing is gold because my preference is always for gold jewellery and I like the matchy-matchy look of gold hardware on both my shoes and clothing too. Again, my basket bag has come out to play but this time I decided to simply remove (or in this case, tuck in) the straps and carry it. This instantly smartens things up and gives off a more formal vibe which is exactly what I was going for with this look. So there we have it, three different spring looks proving how easy it is to change your outfit with your shoes. Let me know which of these was your favourite! Such cute shoes and I've been obsessed with these styles right now too. I do love a good block heel sandal at the moment.